SCHEDEL, H. - Destruccio Iherosolime. Destruccio Iherosolime. - SCHEDEL, H.
Size : 16.9 x 22.8 inches. / 43.0 x 58.0 cm. 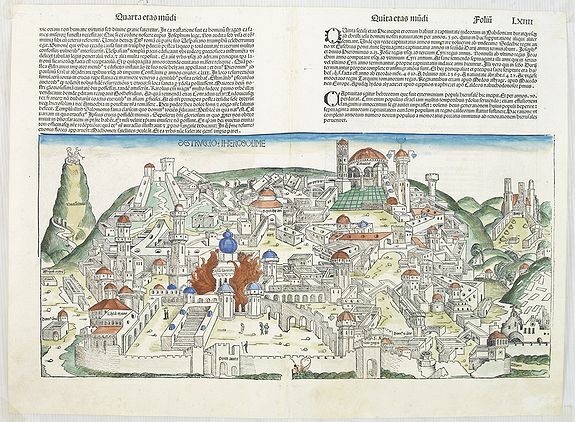 Two pages from the richest illustrated Incunable, the famous: Liber chronicarum or Nuremberg Chronicle, published the year that Columbus returned to Europe after discovering America. Condition : Some usual minor marginal age-toning. Paper has been lightly washed. A few stitch holes filled in as also some parts along lower part center fold. Very good. Size of paper 430x580mm. Margin has been slightly cropped.